Passing Strange: a righteous afro-rock opera comes to Chicago! “Passing Strange“, the Tony-winning black rock-opera is righteous, and it’s being staged in Chicago featuring local soul revivalists JC Brooks & the Uptown Sound… and my chica: LaNisa Frederick. Amen. Passing Strange is the coming-of-age story of “Youth” (Daniel Breaker), a kid growing up somewhere in LA in the seventies. He is disillusioned because he doesn’t fit the common definition of blackness. Floating above the city, getting high in his choir director’s blue Volkswagen beetle, “Youth” decides to uproot himself from everything he’s known in order to find home. It takes a blurry, nomadic trek across Europe to realize some ultimate truths about where he fits in the world and whom he can count among his tribe. Features a great live band (book and music by Stew and Heidi) and meaty writing that sometimes billows poetically like blood in water. For anyone who grew up not fitting in, then realized that they fit in perfectly, after all. Jive on. Below, an excerpt from the Spike Lee-documented Broadway staging. 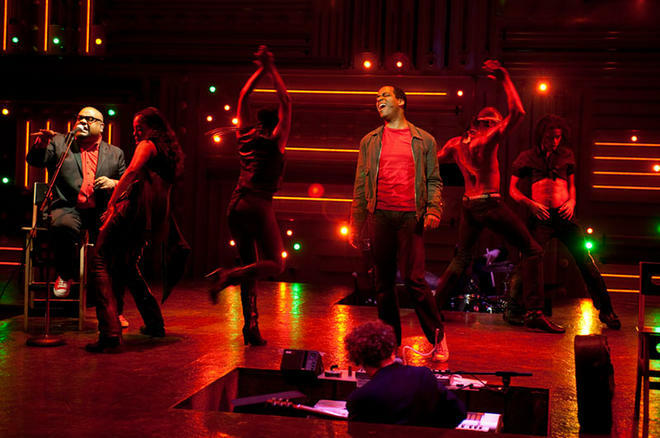 “Passing Strange“, the Tony-nominated black rock-opera is righteous…. Amen. It takes a blurry, nomadic trek across Europe to realize some ultimate truths about where he fits in the world and whom he can count among his tribe. Features a great live band (book and music by Stew and Heidi) and meaty writing that sometimes billows poetically like blood in water. For anyone who grew up not fitting in, then realized that they fit in perfectly, after all. Jive on. Below, from the Spike Lee-documented Broadway staging.